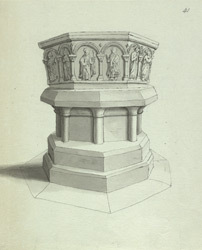 This is a drawing in ink of the hexagonal stone font in St Mary's, the main church in Wareham, Dorset. This is a church of many different architectural styles. Until 1840 it had a large late-Saxon nave, which was then demolished to make way for a plainer one. The chancel dates mostly from the 14th century but contains two 13th-century Purbeck marble effigies of knights. To the south of the church is the medieval chapel of St Edward. Also known as King Edward the Martyr, he was murdered in nearby Corfe Castle in 998AD. His body remained in the chapel for a year before it was taken to Shaftesbury for burial.